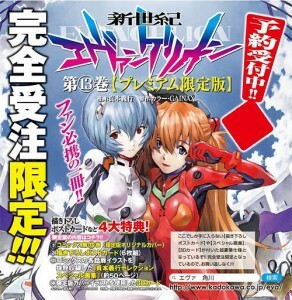 According to Anime News Network, Sadamoto’s Evangelion Manga Volume 13 will receive a simultaneous release in the US and Japan on November 2nd 2012. Viz will release the manga online for $4.99 and in bookstores for $9.99. The Japanese release of Volume 13 will include a premium limited edition (which can be pre-ordered on CDJapan for $10.74) with 4 extras: a 50-page artbook, 6 postcards, a 3D card, and a variant cover.